I, Zeb the Duck, and mom are back home. On March 1 we had an ambulance ride to the hospital. 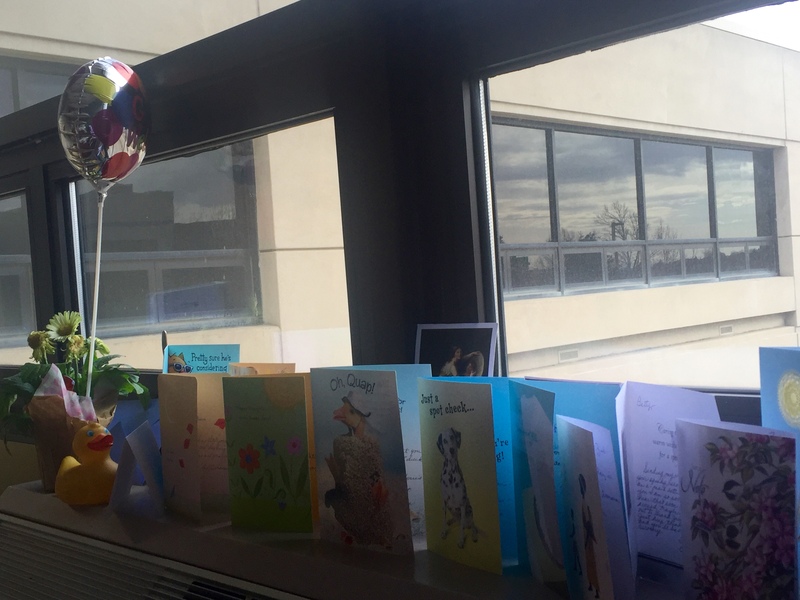 On March 2 mom had emergency spine surgery. 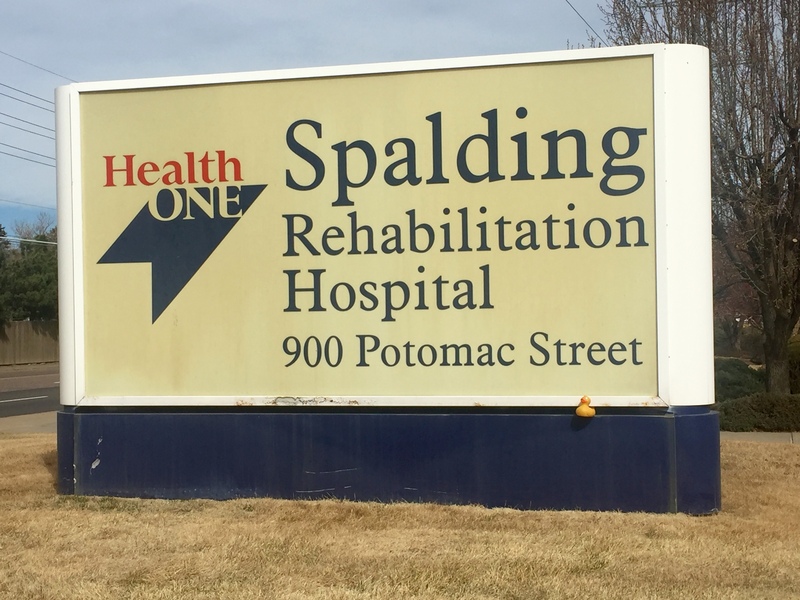 After our stay in the hospital, we were transported to Spalding Rehabilitation Hospital. It was here that mom learned to walk again. We had many hours of therapy, both occupational and physical at Spalding. Several hours were here in the gym. 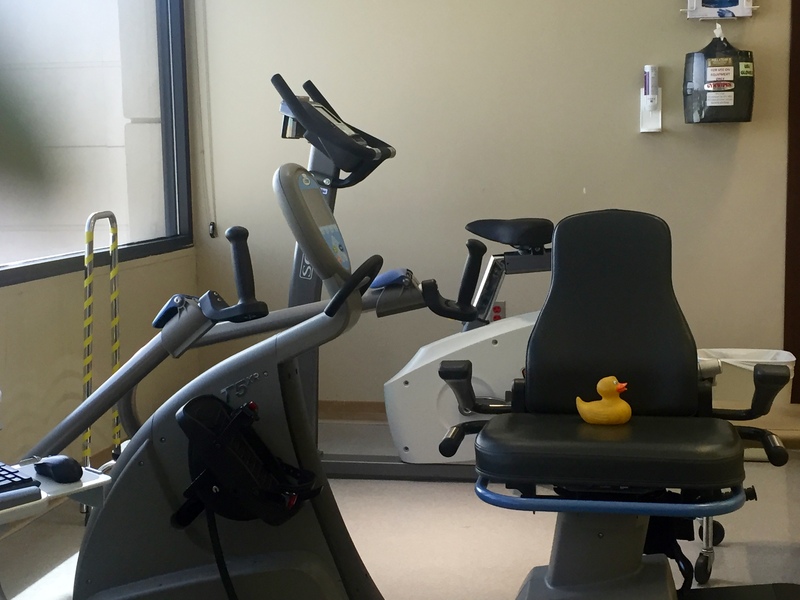 We could look out the window while riding the exercise bike. These bars were often used to do leg and balance exercises. Learning to walk happened here. Eventually we went outside and enjoyed the pleasant spring weather. Mom learned to walk on uneven pavement, to cross streets, and navigate curbs and construction areas. Our last few days at Spalding, we did not use the elevators. Mom and I, and our therapist, walked up and down 2 flights of stairs to get from our room to the courtyard, and back to our room. Our courtyard was peaceful and mom practiced moving around in this area. We could see the courtyard from our room. 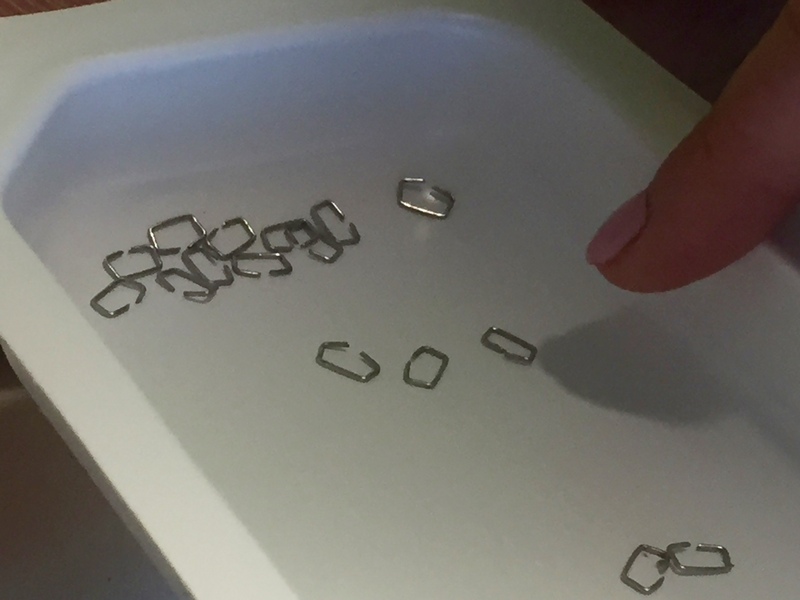 One day the doctor told us it was time to remove mom’s staples from the spine surgery. Of course she could not see the back of her neck, so she thought she had 3-4 staples. Not true. The nurse told her there were 16 staples. Soapy Smith Duck and his mom visited us every day. They were there when one of our favorite nurses removed the staples. Nurse is pointing to the 16 staples that held mom together. The next day they were able to bring us home. Since our return home, we walk a few miles every day, no longer using our walker. We are now almost self sufficient. Mom is even driving now. 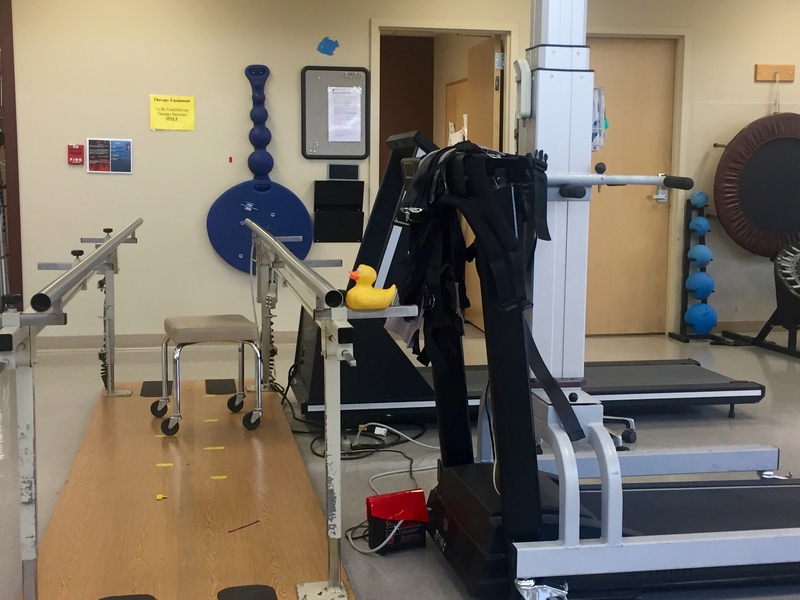 Continued physical therapy has reduced or eliminated most of the pain. Mom had difficulty sitting and using her arms. She could not sit at a table and open mail. Writing was painful and typing was also difficult and painful. 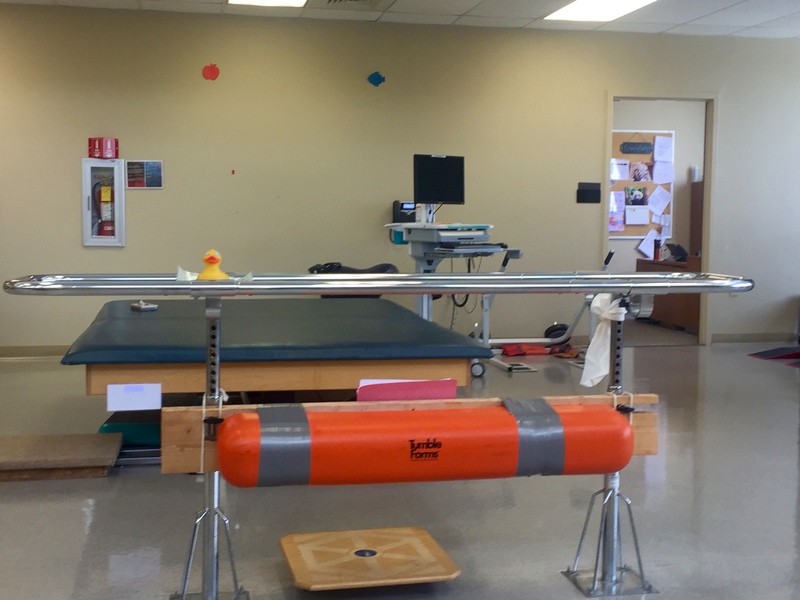 Last week the physical therapist gave us new exercises to strengthen the necessary back muscles. We are eternally grateful to the fabulous hospital nurses and staff, the doctors and our surgeon, the therapists, ambulance personal, dietitians and everyone that helped us recover. All of you that work in the health care industry are greatly appreciated. We, the Colorado Traveling Ducks hope to begin posting a few times a week and to share more from our trip to the United Arab Emirates and the Sultanate of Oman. 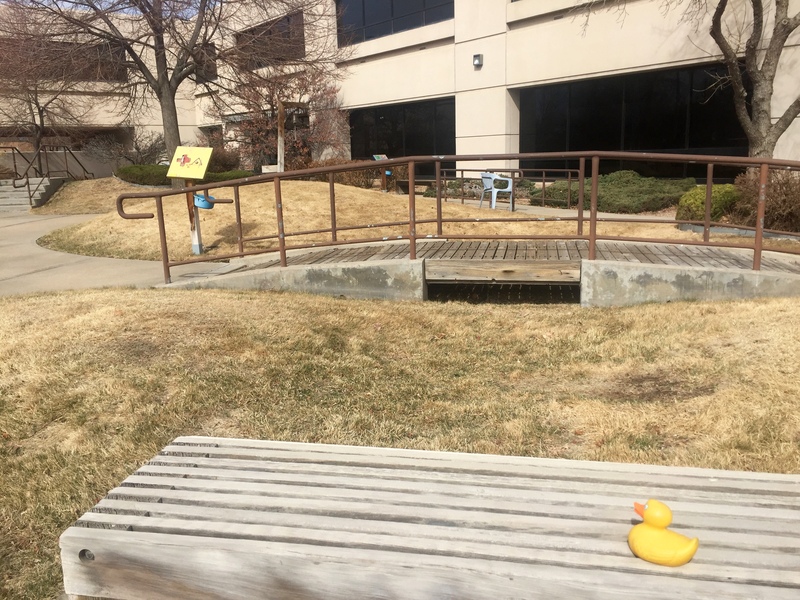 This entry was posted in Uncategorized and tagged Colorado Traveling Ducks, home from hospitals, Spalding rehabiltation Hospital. Bookmark the permalink. Thanks. We are fairly independent now. Each day is a little better. Thanks for reading and commenting. Thanks. Each day gets better. Ready to have adventures and write again. Thanks for reading and commenting. Thanks. It was great to meet you. Hope we can get together for an adventure and blogging. Thanks for reading and commenting. Phew, you’ve had a long haul. I’m pleased to hear that your recovery is going well. Onwards and upwards! Best wishes. Grateful to be improving. Looking forward to more adventures. Thanks for reading and commenting.